Pico, a full-featured, low-noise patch clamp amplifier with an integrated digitizer and headstage. Pico is ideally suited for whole cell (Vclamp and Iclamp) and single-channel (patch, planar lipid bilayer, and synthetic nanopore) recording, as well as cellular electrochemistry. Pico measures just 5.6″ x 2.5″ x 0.7″ (14.2cm x 6.3cm x 1.8cm) and consumes less than 1 watt of power. Brownlee’s quiet electrophysiology amplifiers have four channels of a high gain/low noise amplification, lowpass filter and output offset control with a memory function for each channel. The Brownlee Model 440 adds an 8-pole Bessel lowpass filter, auto-zeroing, a line-notch filter, highpass filter, multiple memories per channel, and a digital voltmeter. A wide bandwidth of over 500 kHz insures smooth recordings. The NeuroLog System is a compact, versatile, modular instrument for a variety of research: intracellular, extracellular, transducer & multi-channel isolated amplification; pulse generation & electrical stimulation; and signal processing & conditioning. 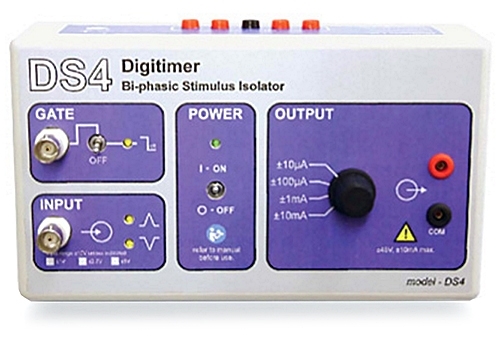 One NeuroLog can be used to monitor several parameters of interest simultaneously. See our list of interchangeable NeuroLog modules. The Hum Bug is a device for canceling electrical interference in real-time, avoiding all of the traditional problems associated with notch filters like phase delays, amplitude errors, DC shifts or waveform distortion. The Hum Bug constructs a replica of noise present on the input signal and continuously subtracts it from the signal as it passes through the instrument, even when noise characteristics evolve over time. 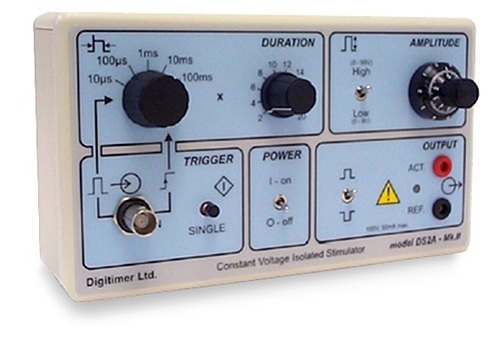 The DS2A provides a precise constant voltage stimulus (up to 100V) controllable in pulse duration and amplitude from self-contained batteries, making it ideally suited to electrophysiological recording in small preparations or cells where low noise is required. The DS3 provides a precise constant current stimulus (up to 32mA) controllable in pulse duration and amplitude from self-contained batteries like the DS2A. The DS3 also features a “clamp” or discharge circuit which discharges the output between stimuli, preventing a charge build up on the preparation which can lead to a loss of stimulus in other constant current devices. The DS4 takes an analogue voltage waveform defined within your own data acquisition/ control system and converts it into an isolated constant current stimulus. The DS4 will accept several input voltage ranges and produces four output range.. It also features a GATE input, so that several DS4 units can be controlled by a single analogue waveform, but enabled individually via this GATE input. 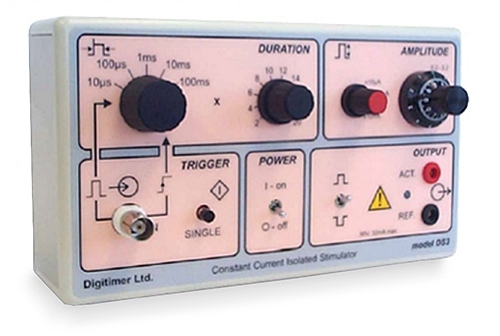 The DG2A is a compact, free-standing, battery powered instrument which can be used to generate trigger pulses required for repetitive stimulation. Also featuring DELAY controls, it is useful for determining nerve or axonal Effective Refractory Period (ERP) through the production of a delayed second pulse. 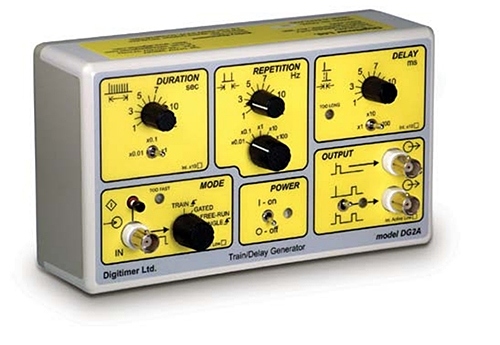 It is especially useful as a frequency generator for use with our DS2A and DS3 isolated stimulators. 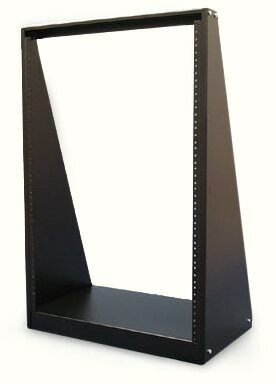 Table-Top Equipment Rack features standard 19” rack panel width mounting, rack mounting on E.I.A. universal spacing (5/8 – 5/8 – 1/2 inch), round hole punched for 10-32 clip nuts (included), a choice of two heights, 21″ (12U) or 28″ (16U) and more. 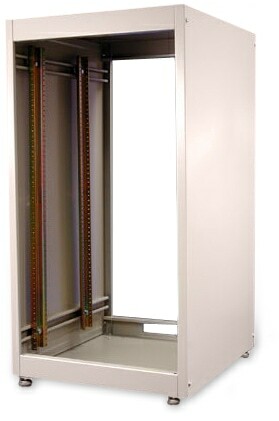 Floor-standing Equipment Rack features standard 19” panel width (21.34” overall), usable depth of 16.5″ without doors, 16″ with doors (17.5″ overall), knockdown rack unit is shipped in a flat pack container for handling ease & protection and more.